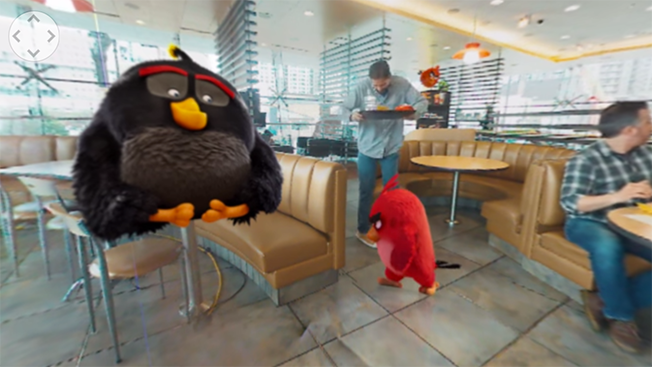 McDonald's has partnered with Sony and Rovio, the creator of Angry Birds, to create a 360-degree video promoting the upcoming feature film The Angry Birds Movie. The 60-second spot puts the viewer in the center of a McDonald's restaurant, as the film's feathered flying stars zip in the air from table to table, dance in the aisles and take selfies with dining families. The film was created in partnership with DDB Chicago and has racked up more than 4.5 million views in less than a week. According to John Maxham, chief creative officer at DDB Chicago, it's the first 360-degree video for McDonald's (unless you count the VR Happy Meal painting activation during SXSW). Maxham said it's also the first time a 360-degree film has been shot for any quick service restaurant. "You need to think almost like an architect," Maxham said. "Where you've got this spacial thing you're trying to figure out and how a story comes to life in that space." Maxham said the Angry Birds game became so popular that it's taken on additional personalities and platforms. However, it's usually the other way around, he said, where a movie character gets his or her own game. To combine animation with reality, DDB Chicago worked with Rovio for the animations using pre-existing bird assets and with Optimist to stitch everything together. According to Shelby Georgis, DDB's creative director, the trick was choreographing animations ahead of time so that the actors were set to work on a specific cadence that makes it look like they're interacting with the animals. "The other thing about 360 is it's really easy to flop a camera in a room and embrace the natural space," Georgis said. "But when it starts getting into storytelling, you really want to take something through a narrative to craft something meaningful."